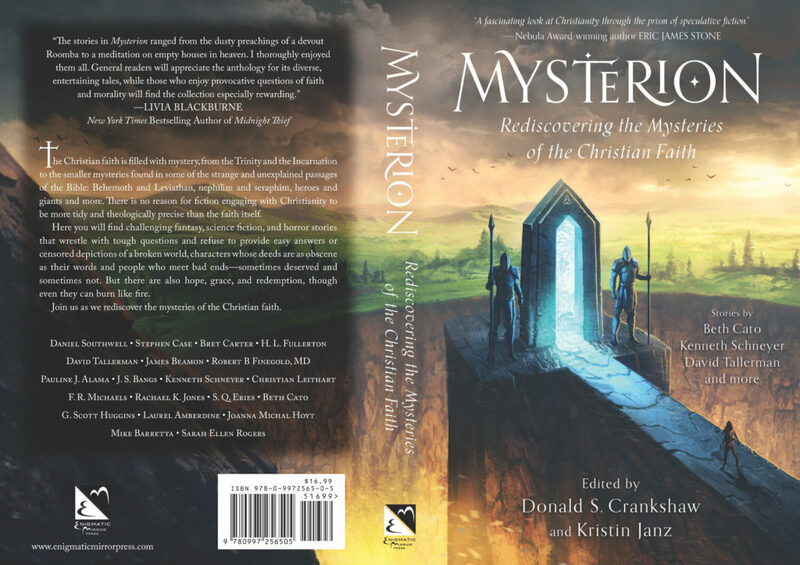 Last year Donald and I published an anthology of speculative fiction stories that engage with Christianity (still available, BTW). This past summer, we ran a Kickstarter campaign, hoping to raise enough to pay the authors for a second anthology. When that didn’t quite work out–we only got to 83% of our funding target, and Kickstarter fundraising is all or nothing–we decided we needed a less cost-intensive way of bringing Christian-themed fantasy and science fiction to readers, ideally one that would help us grow our audience. We’re now pleased to announce Mysterion’s new online home: MysterionOnline.com. We open to fiction submissions in January (and are already open to art submissions), and plan to start publishing stories on the site in April. There won’t be any paywall, but we will be setting up a Patreon for those who want to support us beyond just reading what we publish and sending us their story submissions. Stay tuned for more information on that… We pay 6 cents/word for new fiction, 3 cents/word for reprints, and $100 for art. Donald and I are running a Kickstarter to fund a second volume of the Mysterion anthology. Check it out! Our funding target is $5000, which would be just about enough to pay the authors. We are able to cover the other costs involved in putting together a book–cover art and design, layout, copy editing, etc.–but we haven’t sold enough copies of the first book for it to be feasible to go ahead with Volume 2 without doing some fundraising. 16 days in, 24 days to go, and we’re at 26% of our goal, with 40 backers. So, obviously, we need to get more people to pledge in order for us to go ahead with this. What happens if we don’t meet our funding goal? (Kickstarter funding is all-or-nothing, so if we don’t reach our target, we don’t get anything.) Well, we probably won’t quit publishing. But we won’t be able to open to story submissions in 2017. We’re the only pro-paying market for Christian-themed short speculative fiction; although we’re not a traditional Christian publisher. Our focus is on work that doesn’t fit comfortably in either inspirational or mainstream publishing–we actively encourage story submissions from authors who aren’t Christian, for instance, and are open to publishing fiction that’s critical of the Christian faith as well as stories that affirm it. Read our Theme Guidelines if you’re interested in learning more! And support us on Kickstarter! I had posted earlier about my schedule for Boskone–I was going to be on several panels, and participating in the Boskone Book Party to promote Mysterion. Donald and I were also planning to throw a party. Unfortunately, we’re now unable to attend due to a death in the family. However, Mysterion author Robert B Finegold has very kindly offered to take over our table at the Book Party and promote the book on our behalf. Join us for Boskone’s Book Party! See what’s just out from authors you love, and discover new favorites. The book party will include E. C. Ambrose ( Elaine Isaak ), Neil Clarke, LJ Cohen, Milton Davis, Grady Hendrix, Carlos Hernandez, Jeremy Flagg, Kristin Janz, Hillary Monahan, Cerece Rennie Murphy, Ian Randal Strock, Christine Taylor-Butler, and more! Boskone is held at the Westin Boston Waterfront Hotel, 425 Summer St, Boston. If you’re there, stop by the Book Party and say hi to Dr. Finegold! He’ll even have copies of the book for sale, and I’m sure he would be delighted to autograph one for you. Yes, I’m working on a novel set in this world. No, it isn’t done yet. Kzine is a genre fiction magazine for the Kindle, although a paperback version is also available. They publish science fiction, fantasy, horror, and crime fiction, so it’s great for people who prefer reading magazines where each story is different. Some publications are aiming for a particular sub-genre or aesthetic, and while that can be really interesting if it happens to be a sub-genre you especially love, the downside is that all the stories can start to seem the same after a while (like reading a short fiction collection by one author with a distinctive style). Kzine is trying to mix things up a bit and publish a lot of very different stories together all in one issue. So if that sounds like something you’d enjoy, check them out! The e-book is free if you’re a Kindle Unlimited member, $2.49 otherwise ($4.50 for the paperback). I have another new story out, my third this year. “Children of Cronus” has appeared in Silent Screams: An Anthology of Socially Conscious Dark Fiction, edited by Josh Strnad. The Kindle version is available now, with the paperback edition to follow in a few weeks. Silent Screams is an anthology of dark speculative fiction focused on drawing awareness to the plight of those who are unable to speak for themselves. Simultaneously humane and horrific, each included tale presents a vision of the macabre animated by a beating heart of compassion. It is primarily a horror anthology (although my story is a science fiction tale about human cloning and transplanted brains), so keep that in mind when deciding if this is a book for you. Horror fans should find plenty to appreciate here. My story “As Travelers in Sky Boats” is now up at science fiction podcast Escape Pod. You can listen to it, narrated by Ibba Armancas, or read it at the website. Or both! It’s about clueless cultural anthropologists (in space! ), and an island culture not especially enamored with what Star Trek fans might refer to as the Prime Directive. Well, posts here have been scarce this year. Apparently editing and publishing an anthology is a lot of work. Who knew? Our hope is that the book will be of interest not only to Christians, but to anyone with an interest in fiction exploring spiritual and religious themes. It isn’t “Christian fiction” in the traditional sense. We didn’t insist on “clean” content or that the stories had to uphold Christian beliefs and values. We did want fiction that felt authentic to our own experience of the faith, but we didn’t feel that every story had to portray Christianity in an unambiguously positive way. If you do read the anthology, please consider reviewing it at Amazon and/or other retailers (or Goodreads, or your own blog, or…). Even critical reviews (thoughtful ones, at least) can help other readers decide whether they would like the book. We’re thrilled to finally get this out into the world for readers to engage with! My story “Thou Hast by Moonlight at Her Window Sung” is in the latest edition of SQ Mag, from Australia. They publish in a webzine format, with all the stories available to read for free online. So check it out, and check out the other stories in the magazine! I haven’t read them yet (it just came out today), but there’s a story by Mike Resnick, so it’s not all newbie authors (not that there’s anything wrong with that! ).